“This Day in Jewish History/ a refuge for persecuted Jews is founded- almost” David B. Green reminds us that September 15 was “Founders Day” the day when Mordecai Noah staged his Proclamation Ceremony to inaugurate Ararat- his Jewish Homeland. The Mapping Ararat Project is mentioned in Green’s article which is published in Haaretz- Israel’s leading newspaper. 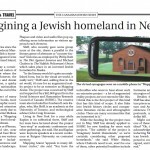 Here is an excerpt from the article “Visitors to the area, which is adjacent to Niagara Falls, who want to explore the Ararat concept more deeply, can avail themselves of a walking tour of the virtual colony on Grand Island, created by a Canadian-American academic team calling itself “Mapping Ararat: An Imaginary Jewish Homelands Project.” Click on this link to read the full article. Mapping Ararat featured in The Walrus! The Social Sciences and Humanities Research Council of Canada has awarded an Insight Development Grant for the realization of Mapping Ararat: An Imaginary Jewish Homelands Project. This is a two year grant which will fund the research/creation phase of the project. The April 3rd edition of The Canadian Jewish News features a lovely article on the Mapping Ararat project by Bill Gladstone. Please click on image below to read or follow this link to read the article at the Canadian Jewish News website.